Beauty is in the details and your bridal bouquet is one wedding detail that you shouldn't overlook. As simple as it may seem, a flower bouquet is more than just a bunch of flowers tied together for you to hold for one whole day. Wedding bouquets are actually part of a centuries-old tradition symbolizing luck and fertility, and the bouquet toss is meant to spread that luck to others. These days, the wedding bouquet is a means of self-expression as well as an essential bridal accessory that brings together a bride's outfit and wedding theme in perfect harmony. As you read through this post, take note of a few essential lessons on wedding bouquets including simple tips in picking the right bouquet, bouquet ideas, and popular wedding flowers. As with any other wedding element, there are a few things that you need to consider when putting together a personal hand bouquet for your wedding. Read our list below for some simple tips on picking the perfect bridal bouquet. At the end of the day, choosing the right wedding flowers depends on personal taste. There's no right or wrong choice, so just go for the ones you like. However, it's important to pay attention to other factors such as your wedding budget and, of course, the availability of your favorite flowers. As sentimental as this might sound, a flower bouquet that is filled with personal meanings and reminds you of a precious moment is the one you want. Your wedding is one of the most important celebrations in your life, and you want every little detail to be perfect. What could be more perfect than a beautiful wedding bouquet loaded with beautiful memories? If your fiancé proposed to you with a bouquet of lilies, having lilies in your bridal bouquet will remind you of the day you decided to be his wife. You can also opt for flowers that have meanings that are close to your heart. For instance, you might want your relationship to have pure and sincere love. You can then combine baby's breath (signifying sincerity) and red roses (symbolizing love) to convey this meaning. 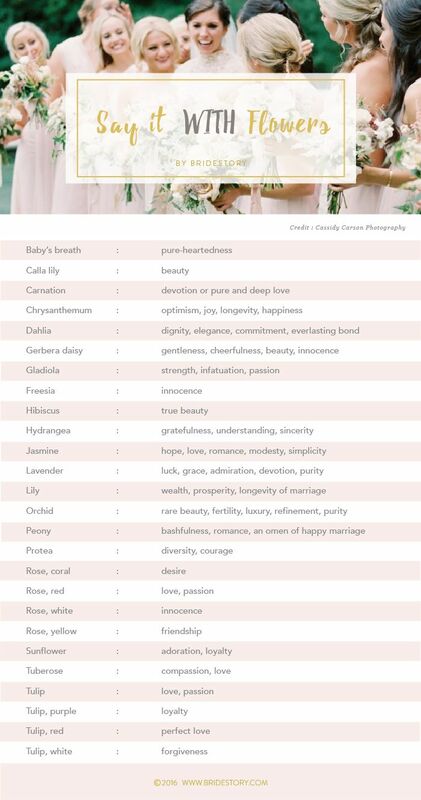 Take a look at the list below for meanings of your most favorite blooms and arrange them accordingly for your very own bespoke, personalized bouquet. This point is technical, yet essential. When choosing your wedding bouquet style, make sure that your bouquet will match your wedding dress and your own figure. A cascade bouquet will overwhelm a petite bride, while a small posy of pansies might not pair well with a tall bride. There are no set rules, but you should always remember to consider the proportions. A bouquet should neither overpower your look nor get lost in it. Considering your wedding theme is one important point. It can help you to decide the colors that should dominate your bouquet. Choosing classic white roses for your Great Gatsby-themed wedding would be perfect, while choosing blue roses for your autumn-themed wedding would be, well, not the greatest idea. You would want your wedding to be as cohesive as possible. 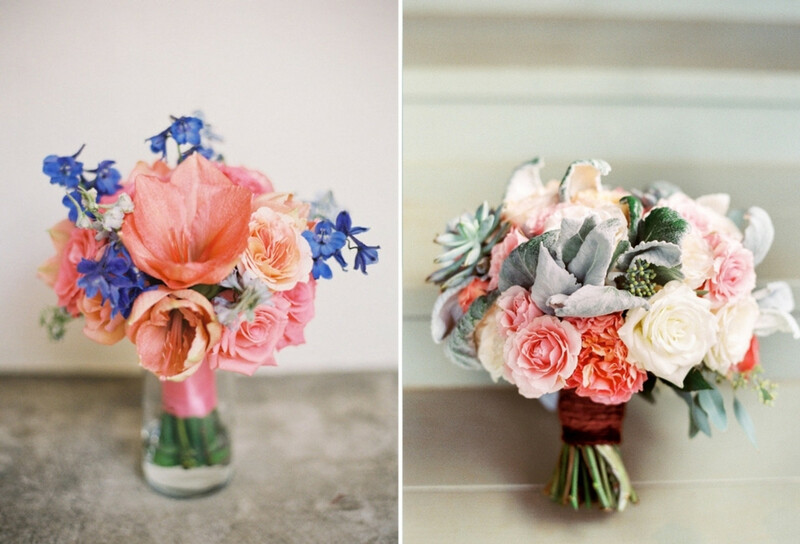 Therefore, your bouquet should match your wedding theme and color palette. After you've collected some awe-inspiring flower bouquet styles and arrangements as inspiration, you need to take them to your wedding florist. It's not as simple as telling your florist to simply imitate a bridal bouquet you like, though. Floral arrangement is a craft that requires skill and experience, and different florists usually specialize in different styles. Before you place any orders, make sure to read our article on choosing the right wedding florist and flowers first. There are so many beautiful flowers that you can choose from, so it can be hard to decide on the right flowers for your bridal bouquet. 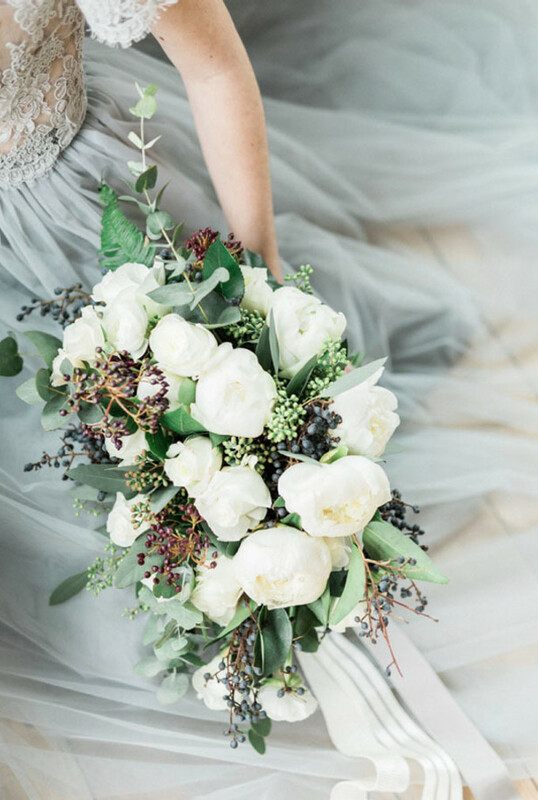 To make your search for the perfect flower bouquet easier, we've compiled a list of the favorite wedding bouquet flowers of all time. Take some time to get to know the most popular wedding flowers below, then pick the ones that suit your wedding in every aspect. The blooms should ideally be in season on your wedding day, match your wedding color scheme, and of course, have beautiful meanings that you'll cherish forever. The classic bouquet flower and, in our opinion, the best all-around wedding flower. Roses are romantic, showy, hardy, and they come in so many different colors that you can easily fit them into any color scheme. They're also very easy to ship, making them the perfect choice when it comes to destination weddings or for a wedding held somewhere with limited flower options. For outdoor weddings, this ancient symbol of love and passion stands well under the heat and is very economically priced for a such a high-impact bloom. Calla lilies are so sleek and stylish, they will make your whole outfit look completely modern. The calla lily is a classic wedding flower and it usually comes in a range of white to ivory. These days, however, calla lilies come in plenty of different shades including red, purple, and orange. Aside from their modern look, the distinctive shape of the calla lily is so unforgettable, making it highly impactful in any wedding celebration. Calla lilies are perfect for an outdoor wedding in the summer thanks to their resistance to heat, but they don't hold up well in cold weather. Lilies have a very strong fragrance; having them inside your venue will scent the whole room nicely. They're also very showy thanks to their bright color, full petals, and colored edges; perfect for glamorous weddings. Lilies symbolize wealth and prosperity, and are linked to the longevity of the marriage. These blooms come in shades of green, white, yellow, orange, pink, red, and purple with speckled petals. Orchids are so unique, they can stand on their own or add texture to a simple floral arrangement. These blooms also come in different shapes and colors, making it easy to create a bespoke flower bouquet based on your personality. Orchids are available all year long and they're strong enough to withstand an outdoor wedding. It has been said that orchids symbolize fertility, luxury, beauty, and love. The ancient Chinese interpreted them as a symbol of refinement and purity. With such lovely meanings instilled in them, orchids are without a doubt well-suited for weddings. 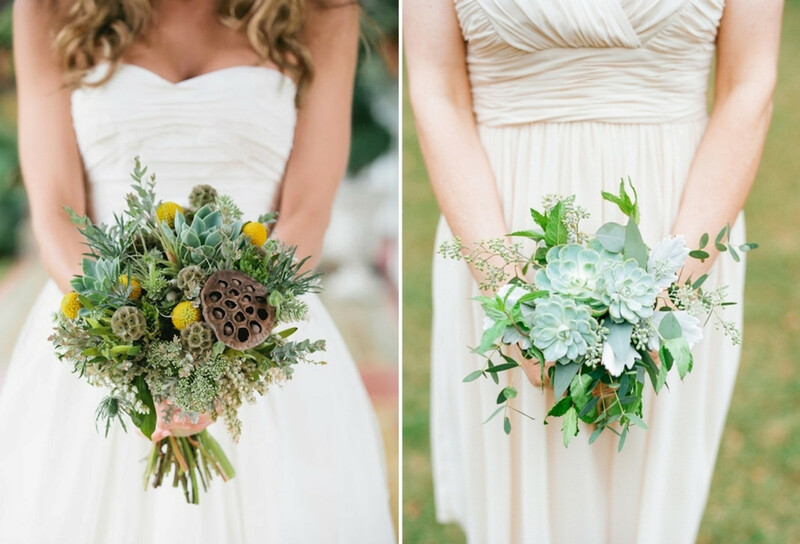 They may not be flowers, but succulents sure are popular in wedding bouquets lately. Succulents, or also known as fat plants, have thick and fleshy parts that contain water. Aside from their beautiful shapes and colors, they can hold up well without water for a long time. Their versatility also enables them to fit in nicely in formal or casual affairs, weddings with pastel or bold colors, even in tropical settings. As wedding "flowers", succulents are associated with enduring and timeless love. The more reason to incorporate them into your wedding, don't you think? Often linked with romance and prosperity, this lush and feathery flower is usually made the prime flower in a floral arrangement. The traditional flower symbol of China comes in romantic colors ranging from soft white and blush down to bold magenta and red. Thanks to their wide range of colors, you don't need to doubt the versatility of peonies in any kind of bouquet. Often linked to romance and prosperity, and also considered as an omen of good fortune and happy marriage, peonies have a limited season from May to June and from October to December. Hydrangeas are such friendly flowers that looking at them evokes a feeling of comfort and being at home. 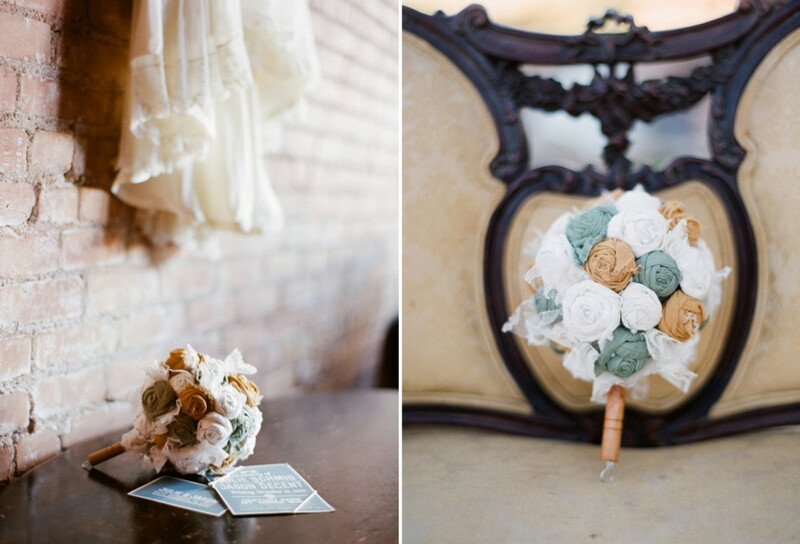 They come in a puffy, ball-like structure and are perfect for an English country wedding. Thanks to its shape, having hydrangeas in your wedding bouquet will definitely bring that extra oomph to your bridal ensemble. They usually can't last too long in the summer heat, but in a chilly autumn wedding, the flowers will hold out longer outdoors. Simple and elegant, tulips are the perfect flowers for brides who love to keep things looking innocent and chic at the same time. These long-stemmed flowers will create an elegant look, both in a homogenous floral arrangement or combined with smaller flower types. The best thing of all, they are relatively easy to find and are available in hundreds of unique varieties and colors throughout the year, with the best ones appearing in mid January through May. Generally, tulips carry the meaning of love and passion, but different colored tulips are associated with different meanings. White ones convey forgiveness, purple represents loyalty, and the reds speak of perfect love. As a wedding flower, it is without a doubt that the distinctively-shaped protea will catch the attention of anyone who lays eyes on them. Named after the Greek god Proteus, proteas have a wide variety of shapes and colors. The one in highest demand these days, however, is the pure white breed of the flower that excites brides everywhere. Considered the national flower of South Africa, proteas are in season in from September to March, with its peak season on October and December. Befitting its spiky petals and large head, the protea symbolizes diversity and courage. Their rounded, structured petals make dahlias capture attentions quickly. They come in both soft colors like peach or white and vibrant colors like magenta, purple, even black. The national flower of Mexico comes in a range of sizes and shapes. Dahlias are also reasonably priced; the more reason to include them in your big day. It has been said that dahlias express sentiments of dignity and elegance. They also signify commitment and a bond that lasts forever, the very things a couple wishes for in their marriage. With its thin and long purple stems, the lavender has been one of the most popular flowers in the world of weddings. Its rustic beauty and enchanting scent has made it a favorite of many. Lavenders are usually seen as filler flowers in a grand floral arrangement, or being put together as a sole flower bouquet in rustic weddings. The great thing about lavender is that it's highly versatile, so you can use it in with both soft and bold color palettes. There have been a number of meanings tied to lavenders. To name a few, serenity, grace, admiration, purity, devotion, beauty and love are some of them. This notable flower is certainly a mood booster. The presence of sunflowers in your wedding will instantly add a joyous and bright atmosphere. This state flower of Kansas and national flower of Russia reaches its peak in July through September. A little-known fact about this flower is that it actually comes in colors other than yellow; such as red, orange, and brown. But yellow sunflowers are definitely the most popular choice for the ultimate summery feel. There are plenty of noble meanings associated with sunflowers, which mostly come from its namesake, the sun. It represents faith, longevity, and healing. On a more romantic side, sunflower represents adoration and loyalty, as the flower always turns itself towards the sun. Traditional flower bouquets are timelessly beautiful and glorious. However, flowerless bouquets can be as pretty and can hold so many personal meanings. Before you get all giddy and start thinking of having one for your own nuptials, take into consideration whether or not the style suits your personality and your wedding theme. You wouldn't want to end up regretting the decision of not going with a traditional bouquet. No one would’ve guessed that these beauties are actually made from paper. This is a way to cut your wedding flower budget, as real flowers will always be more costly. Make sure to find a really good vendor for this to avoid low quality, cheap-looking paper flowers on your bouquet. This one would appeal to the vintage bride. 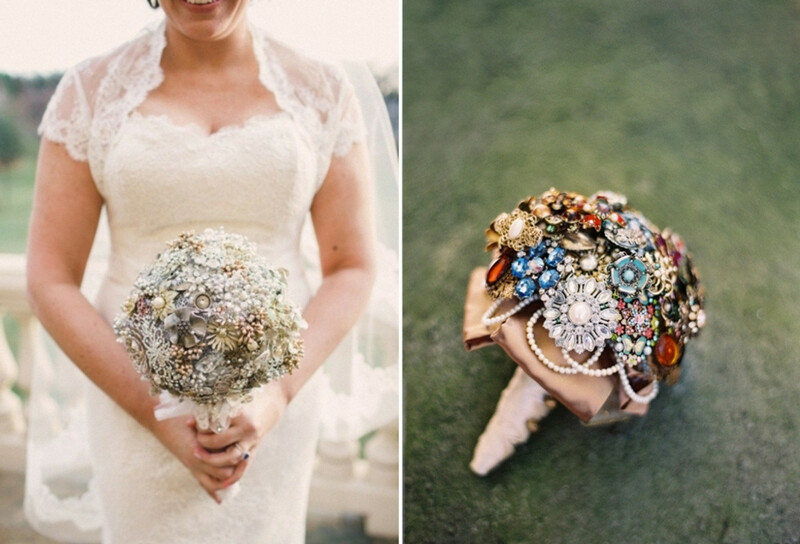 Gather antique brooches and arrange them together to form one stunning bouquet. To add more sentimental value, gather heirloom brooches from the ancestors in your family or from your closest friends and relatives. Literally flowerless, this kind of bouquet uses only greens and non-floral exotic plants in your arrangement. Succulents, billy balls, lotus roots, your call. Fabric bouquets are beautiful in their own unique way. You can use fabric scraps from your wedding dress, ribbons or silk, even a pashmina as your bouquet material. Take into account that this bouquet requires some artistic skills to make, so do trial and errors several times or ask help from the pros to prevent it from unraveling on your wedding day. Using metal flowers as a flower substitute will bring in a really unique feel to your wedding look. You have to really diligently look for the right metal flowers, though, as you need to carefully mix and match them to get the perfect color. So scour all those vintage shops and get shopping! 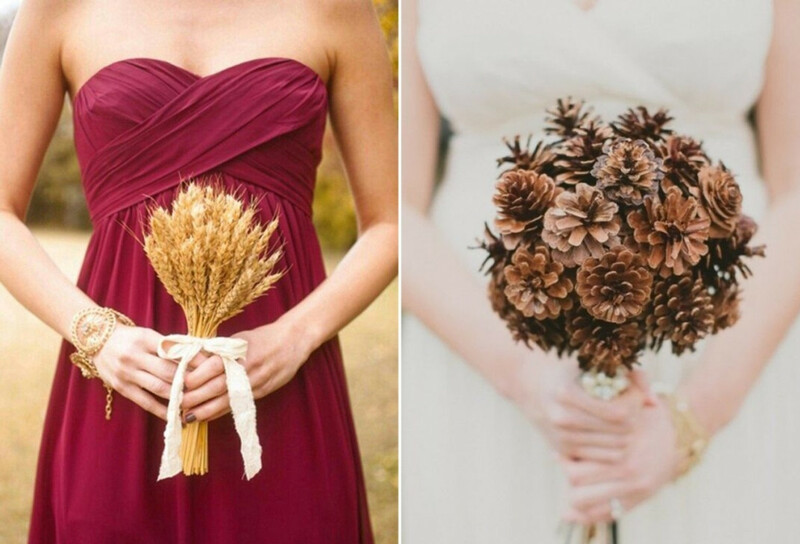 Last but not least, use other all-natural substitutes for your bridal bouquet. We guarantee that your guests won't stop talking about your organic bouquet after the wedding. You can use pinecones, wheat, even fruits if your heart desires. 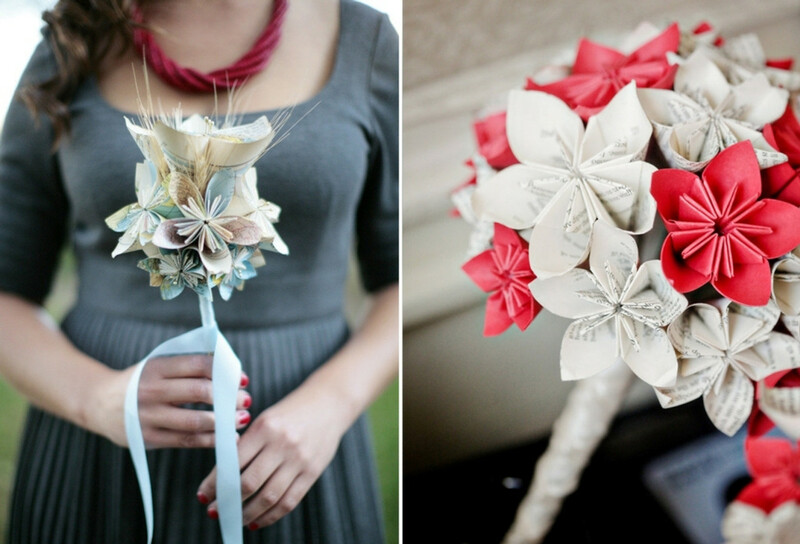 To get even more creative, you can use pages of your used books and turn them into flowers for your bridal bouquet. You can take pages from old books, sheet music, even maps for variation and color. Sure, a classic rose bouquet is lovely, but you might want to make your flower bouquet more interesting, on-trend, and suitable for your wedding. We've collected some amazing wedding bouquet styles that we're expecting to decorate so many beautiful weddings this year. Filled with charm and a natural feel, the hand-tied bouquet features a bunch of flowers gathered together and tied simply with a ribbon or string. The trend nowadays is to keep the ribbon long and cascading, making it a stylish decorative element to the whole bridal ensemble. You can opt for a plain ribbon or something with a simple pattern like the one above. Also known as a teardrop bouquet or waterfall bouquet, this statement-making bouquet features cascading flowers instead of ribbons. Popular back in the 1980s, cascade bouquets have made a comeback with a shorter length and a more casual feel. Today's cascading bouquet can add a sense of effortlessness which suits rustic and alfresco weddings so well. This bouquet style can also make you look taller and complement sleek, fitted gowns and plunging necklines beautifully. Classic bridal bouquets usually have a rounded shape, but you can actually opt for a flower bouquet that does not look like a ball. 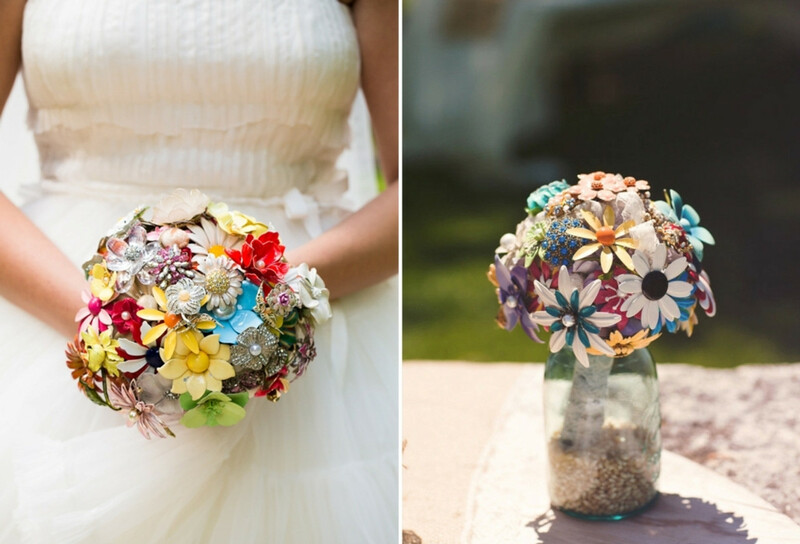 Instead, you can have your bouquet loosely organized like the ones above. The refreshing, messy style will particularly suite a bohemian-themed wedding or a simple wedding dress that needs a boost of style. Flower bouquets don't have to come in the usual shades of white, blush, or pink. Why not be a bit bolder and bring in dark and rich hues into the arrangement. Deep shades of berry, purple, and plum will look amazing mixed with softer colors. All those flowers leaving you uninspired? Just replace them with plenty of greens. As you can see, these leafy bouquets don't look less elegant than the usual flower bouquets. Perfect for a rustic wedding or garden party, this bouquet will surely be the talk of the night. So there you have it, stylish and absolutely beautiful bouquet styles that we believe will be trending this year. Want more wedding trends? Read our 2016 wedding trend forecast and don't miss out on our wedding trend survey if you're an Indonesian bride!